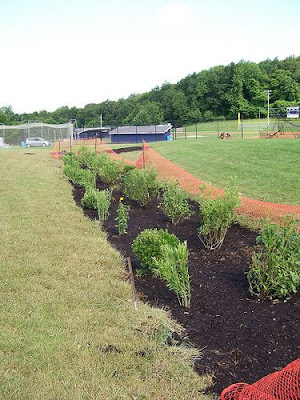 The Randolph Middle School rain garden was installed to serve as a demonstration rain garden to educate homeowners, business owners and government facilities on how rain gardens can minimize impacts to nearby waterways. The rain garden was designed to manage stormwater runoff from the mowed lawns behind Randolph Middle School. Any overflow water will continue through the garden, down the lawn. Approximately thirty people were present for the installation of this rain garden, among them faculty and students from Randolph Middle School, Raritan Highlands Compact, Master Gardeners of Morris County, and Rutgers Cooperative Extension Water Resources Program faculty and staff. This rain garden was approximately 375 square feet, treating a drainage area of 6,000 square feet of impervious surface. Topsoil and sand were added to the garden during installation to help increase infiltration. The rain garden is maintained by the Randolph Middle School ground staff.